The larger part of Montenegrin vineyards are located in the southern and coastal regions of the country, the most seducing places in the country. 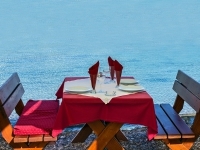 Montenegrin wines are made from a wide range of grape varieties including Krstač, Cabernet Sauvignon, Chardonnay and Vranec. 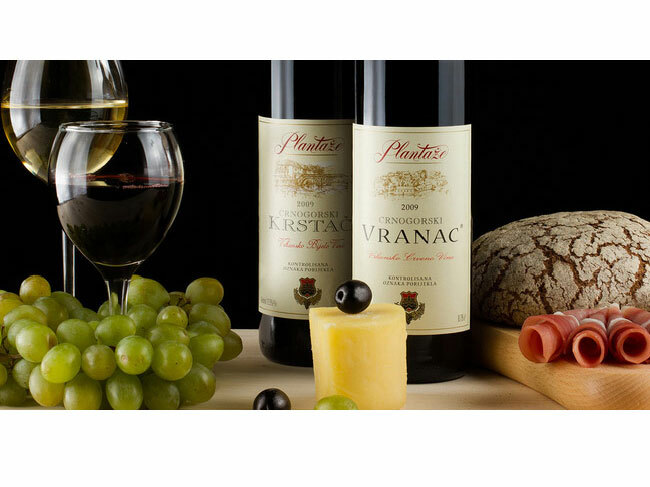 Vranac is a high quality dry red wine, of dark ruby colour with nuances of violet, of pleasant fruity smell, rich, temperamental and pleasant, with a 12% alcohol content. Krstac is the highest quality white wine of controlled ori¬gin, extremely rich, of harmo-nious bouquet and of light yellow colour. Crminca is a cult name in Montenegrin wine-making: a cradle of autochthonous sorts of vine – Vranac and Krstač and a place with a long tradition of top level wine and brandy making. Not far from the Skadar lake, on the Ćemovsko plane, at 2000 hectares, there is a huge plantage vineyard from whose grapes best quality wines of controlled origin and quality, Vranac and Krstač are made. Grape brandy is the best ambassador of Montenegrin vineyards. The autochthonous Montenegrin sort Vranac is what gives loza its unique aroma. It is 50 degrees strong and is best consumed with smoked ham, dry meat and cheese. It is drunk as an aperitif, cooled. 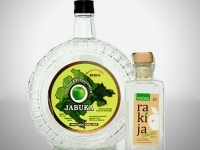 Kruna is the best quality brandy of pleasant aroma, pure and harmonious taste and very drinkable. Biotechnical Institute in Podgorica produces the elite Institute's loza by a special recipe. Only 6000 to 8000 litres of it are made every year! Nikšićko beer is the favourite and unique national lager beer produced since 1896. 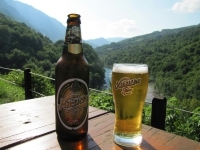 It is made from barley, hard mountain water and bitter and aromatic hop. They serve it cooled at temperature of 5ºC. It is of highest quality, specific taste and pleasant bitterness which make it drinkable and fit for quenching thirst. It has a 11,8 % extract and 5 % alcohol content. Mead is the national drink of Old Slavs. Their supreme pagan God Perun is shown with a horn overflowing with mead. It is obtained through alcohol fermentation of a solution of natural honey, and the procedure is the same as that for the production of wine. 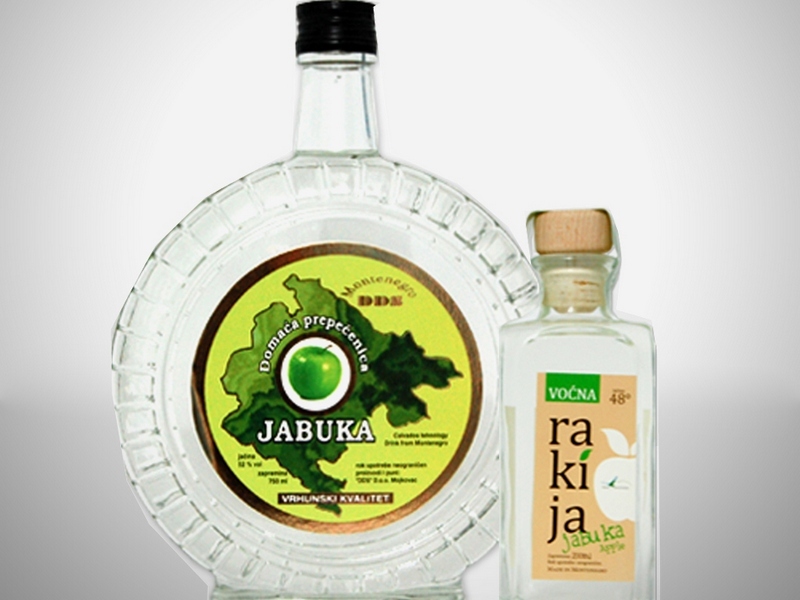 It can be produced as alcoholic and non-alcoholic drink. They serve it in the coffee-house "Kod Pera na Bukovicu" in Njeguši and in the restaurant "Konak" near Cetinje. Grape-gathering is the first phase in the production of brandy, though it might be made also from plums, figs, pears or cornel berries. The gathered grapes are crushed and than poured into wooden barrels. They are mixed several times a day, the more often the better. The obtained mass is called wine-marc. The process of alcoholic fermentation usually lasts fifteen to thirty days. When it is finished, or when, as people usually say the marc is still, distillation begins i.e. the making of brandy, which is done in special copper cauldrons. Hand made copper cauldrons can still be found in Montenegrin households. Marc is put in the lower half of the cauldron and when it is almost full, it is closed with an oval lid, which collects steam and leads it into the condenser. The steam is cooled with water which passes over the pipes or the pipe is simply dipped into a barrel filled with water. The pipe has a spigot like ending through which liquid alcohol pours. Brandy leaks out in a thin jet and it is considered that the thinner the jet is the better brandy is obtained. The cauldron is traditionally set on a three-legged base or on a special fire box under which the same kind of wood is usually burned. The best wood is half-dry beech, for it produces the ideal temperature at which the desired alcohols are separated. The temperature must not exceed 300 degrees Celsius. Grape brandy is 50 degrees strong. Earlier the strength was determined according to the time during which small bubbles remained on the edge of the vessel in which the brandy was poured. Brandy has the same number of degrees as the number of seconds during which the bubbly wreath remains on the brandy surface after pouring. According to old customs, brandy is made in the evening or during holidays, when there is nothing else to do. Whoever sees smoke is considered invited to come to the ritual of brandy making. One cauldron usually takes around four hours to be made. In Montenegrin villages, people usually gather during the season of brandy making. Pagan sitting up late around the cauldron is an occasion to meet people, rejoice and talk with friends, over snacks and with incessant brandy degustation.